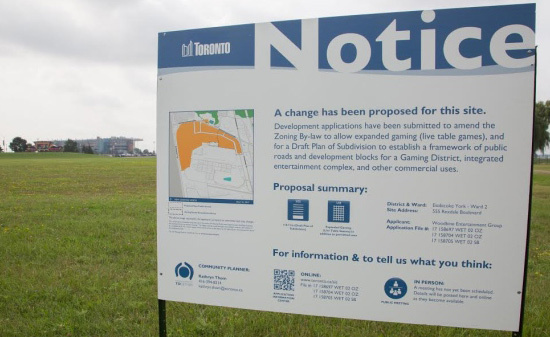 Great Canadian Gaming (GCG) has provided an update regarding its casino operations in the Greater Toronto Area, including site information for Ajax and Rexdale. If you have been reading my blog, I have been writing about the changes to gaming in the GTA for years and predicted that casinos would be approved and placed at both Ajax Downs and Woodbine locations. This update confirms those predictions and also sheds some light on a few more details. In a document available at Great Blue Heron Casino in Port Perry and through its website, GCG outlines that it will assume operations of Great Blue Heron as of January 23, 2018. Also, it shared a few details of changes to be expected there, and at the other locations it will be taking over under Ontario Gaming GTA LP, a limited partnership between Great Canadian Gaming, as well as Brookfield Business Partners LP, and Clairvest Group, Inc. Great Canadian Gaming will operate the gaming portion of the properties, as announced on August 8, 2017. It promises an "expanded and redefined" destination, with new gaming options. While not expanding any further with regard to what that means, it's reasonable to expect that there will be, at a minimum, a facelift to the existing facility. Since opening in January of 1997, there hasn't been a great deal of improvement to the main casino. Also, it would be likely that there will be more types of games introduced into the mix at GBH. The casino does not offer any dice-based games at present, while Casino Brantford does have both craps and sic-bo. Both of these provide an alternative to patrons that prefer something different than card games and roulette. The OLG Slots at Ajax Downs will be re-branded as Casino Ajax. They also indicate that the site will transform into a "one-stop shop for entertainment", including gaming, casual dining, live music and headline shows. The inclusion of live entertainment capability implies that they will be building an attached or adjoining theatre to the casino. 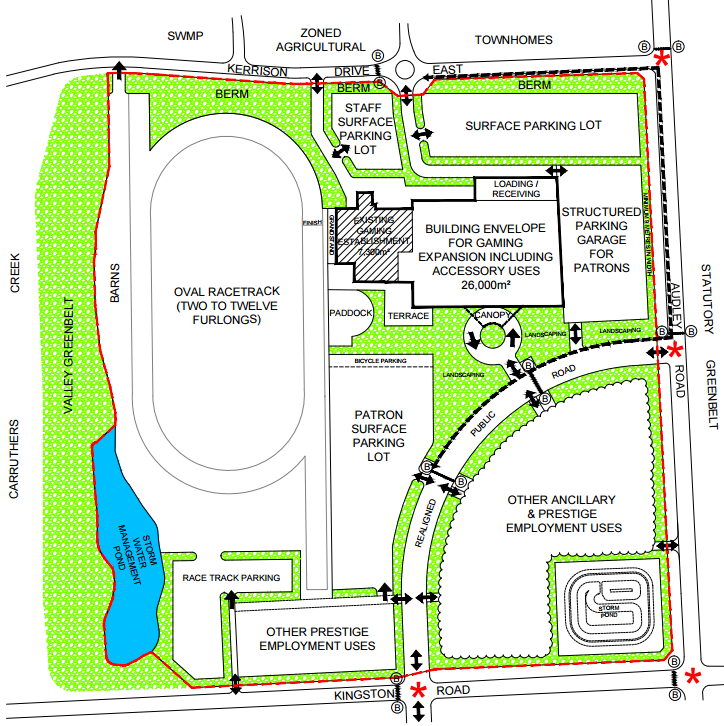 It remains to be determined if they intend to follow through on the site plan approved by Ajax council last year, as indicated in the graphic below. It provides for a 26,000 metre expansion to the existing building, along with a parking structure. It is possible that a theatre could be placed in the south portion of the site. What remains to be seen is whether the casino operation could be expanded inside the existing structure before the new one is completed. If you have visited the existing slot operation, it's pretty well packed, at least in the slot area. Casino Woodbine will be the new name for the OLG Slots at Woodbine. It is slated to become a "top-tier" landmark gaming and entertainment venue. Given the magnitude of the project, it is certain that Casino Woodbine will initially operate within the existing building, with upper floors being used for the expansion of gaming beyond slot machines. The biggest challenge for Casino Woodbine will be staffing - expanded gaming requires licensed dealers. Aside from the existing staff at other sites (like Great Blue Heron and the Shorelines Casino properties east of the GTA), there is not going to be an adequate pool of qualified people to hire into a major casino. I expect to see a major hiring spree in the very near future. It is likely that Great Canadian will move a number of lower and middle management people into Woodbine from both local and also its Western Canadian properties. Those who are willing to switch one of the new sites should be able to move into a higher position far faster than may have been possible while working at a smaller site with a limited turnover in those jobs. Combined, there will be several thousand new jobs created between the two new sites alone - many of them paying very well, both in the construction and operational stages. That is welcome news for the GTA. New websites have also been launched for Casino Ajax and Casino Woodbine. There is not a great deal on the websites - for now, but expect that to change soon.